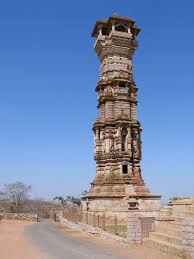 Kirti Stambha is situated at Chittorgarh Fort in Rajasthan, India. This Kirti Stambha Tower was constructed in the 12th century. The tower is about 22 metres in height. Kirti Stambha was constructed by a Jain merchant named Jeeja Bhagerwala. Kirti Stambha Tower is a must watch destination in Rajasthan. Kirti Stambha Tower is also known as the Tower of Fame. This Chittor fort is one among the most famous forts in the world. Vijay Stambha or Tower of Victory lies nearby the Kirti Stambha Tower.